A dramatic video shows a crying Syrian mother with a child in her hands being pushed back by her husband on the rail tracks in protest of police stopping the train with desperate asylum seekers trying to reach Western Europe via Hungary. The heart breaking scene was caught on video as a train full of asylum seekers bound for the Austrian border was stopped by authorities in the Hungarian town of Bicske on Thursday. The migrants reportedly started to bang on the train windows, shouting "No camp, no camp," protesting their dispatch to a migrant reception center. The video from the scene shows a Syrian refugee woman holding her child while standing by a train car. She is crying and pleading to police trying to explain that she cannot return home because of the conflict in her country. Her husband, apparently overwhelmed with emotions, suddenly grabs her and the child pushing the two down on the rail tracks. He hugs her and starts shouting as police wrestle them apart, handcuffing the man. 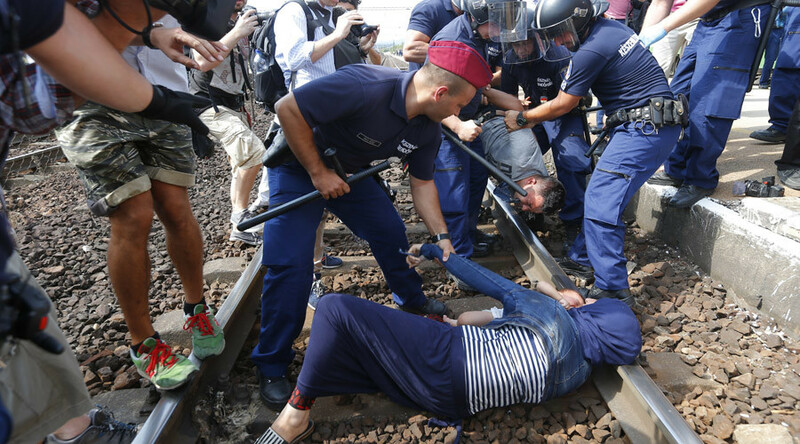 The protesting refugees were arrested, while dozens of asylum seekers from the train have fled, according to Reuters.